These aren't just words -- our Sales, Customer Care and Shipping teams understand these terms, you can count on Arc-Zone to deliver. Business Across Borders is Our Specialty! Our preferred shipping vendor is UPS. We can pre-pay and add the charges to your order, or bill to your UPS account. If you prefer, we can ship your order via DHL, FedEx, or use your freight forwarder or expediter. If you have any questions, we are available by phone 8 am to 5 pm Monday through Friday (GMT -08:00) Pacific Time. You may also communicate with us via email, live chat or fax. *Note: Your security is very important to Arc-Zone. Do not send us your credit card information via email -- it is not secure -- contact us and we will advise you on payment options! It's about providing your customers with the right welding equipment, and the knowledge to weld better. As a local supplier, we know you can't stock everything for everyone. Arc-Zone serves a world market, and we stock a lot of specialty High-Performance Welding Accessories. We'll do whatever we can to make it easy for you to do business with us, including sending you a quote via email or fax so you can get approval for the items you need. Arc-Zone offers a discount to qualified resellers. For our premium distributor partners, additional discounts may apply. Call and find out if you qualify! Ever try to buy from a company and you can't even figure out who to talk to? We know it can be frustrating, so that's why we offer a Fast Account Set Up service. Sure we have a fancy form that our accountants and lawyers have come up with, but if you have contact names, banking information and credit references on your own letterhead, send it on over! We can usually get you approved the same day. We're also pretty quick at filling out the forms you may require, so don't hesitate to request an account. Of course we take credit cards too. Not sure which torch is right for your customer's application? Need a customized product? Having a hard time finding replacement parts for your older welding equipment? We have a toll free number, 800-944-2243, and our Welding Expert can help you out. Our Learning Center is chock full of operations manuals, set up guides, and How-To articles on welding. We also have a links page, putting you in touch with manufacturer's websites, professional associations and even welding schools. It's about making sure you have the equipment, and the knowledge to weld better. Does the idea of buying a new TIG torch intimidate you? Come on. Be honest. You know which TIG torch you want, but you don't know if you need the 10N series or the 13N series parts. It's confusing. And what if the parts you get don't fit on your torch? It can happen. Even if you bought all the right parts for your torch. It's irritating. 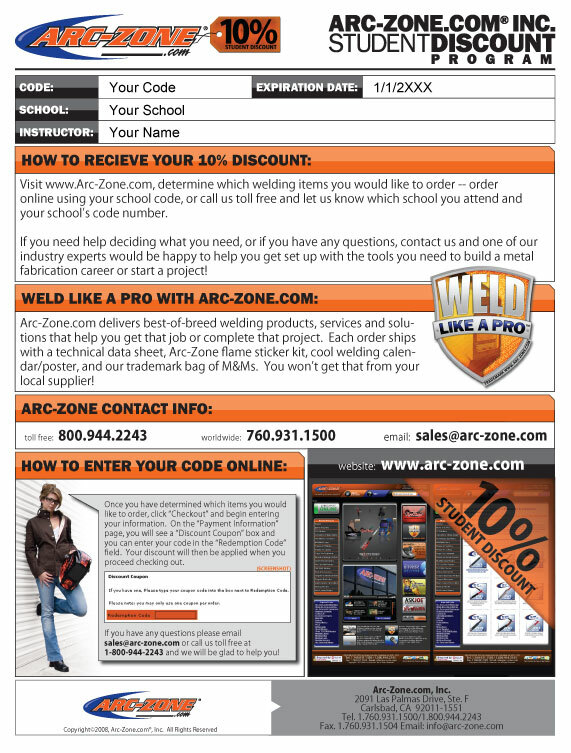 Arc-Zone.com has teamed up with Weldcraft to bring you TIG torch packages that are assembled with all the parts you'll need to start welding right out of the box. And the best part is, we use only Genuine Weldcraft, so you know all the parts are engineered to work together. And, if you're looking for replacement parts, Arc-Zone.com offers a complete line of TIG torch parts and accessories. Arc-Zone has put together everything you need to upgrade your air-cooled welding system to a water cooled welding system. Not sure which torch is right for you? Need a welding torch customized for your application? Having a hard time finding replacement parts for your older welding equipment? We have a toll free number, 800-944-2243, and Jim Watson, our Welding Expert can help you out. Jim's a master fabricator. He doesn't just sell this stuff, he uses it! Our Learning Center is chock full of operations manuals, set up guides, and How-To articles on welding. We also have a terrific links page, putting you in touch with manufacturer's websites, professional associations and even a few welding schools. It's about making sure you and your students have the equipment and consumables you need when you need them. Many of the manufacturers we represent offer additional discounts for educational institutions, so don't forget to ask. We'll do our best to deliver high-performance MIG, TIG and Plasma Arc Welding supplies at a price you can afford. We'll do whatever we can to make it easy to do business with us, including sending you a quote via email or fax so you can get approval for the items you need. For a quick quote, use our online shopping system, and when you go to check out, select the "Print Order Form" button. If you need to shop with a purchase order, no problem. We can get you set up fast! Our preferred shipping method is UPS Ground, but let us know if you need your order in a hurry. We generally Prepay and Add the shipping charges, but if you'd like us to bill to your account, we can do that. And we never add a "handling fee." We can also ship FedEx, DHL, or even the U.S. Postal Service. Whether you like it or not, equipment does become obsolete and replacement parts become harder and harder to find. If you've been holding off on upgrading your equipment, our Cash In and Trade Up program could be right for you. We've developed the simplest, most cost-effective way for you to use your outdated MIG guns, TIG or plasma torches, water coolers, and robotic peripherals like cash, and get new Arc-Zone.com productivity-improving products. Not sure which torch is right for you? Need a welding torch customized for your application? Having a hard time finding replacement parts for your older welding equipment? We have a toll free number, 800-944-2243, and our Welding Expert can help you out. It's about making sure you have the right equipment to minimize variables and keep doing high-quality welding day in and day out. We'll make sure you know about high performance consumables or replacement parts that could improve your welding operation. Arc-Zone serves a world market, and stocks high-performance replacement parts that manufacturers need to improve quality and productivity and minimize downtime. Whether its an OEM (original equipment manufacturer) or a quality aftermarket part, Arc-Zone makes sure to supply you with only the highest quality products. We know how important it is to minimize variables and ensure that replacement parts are engineered to fit. With our Blanket Purchase Order plan, no special order is required. We'll work with you to determine the quantities you'll need and stock those parts for you. We'll get you the best quality parts, and for large quantities, we'll be able to get you the best price too. Eighty-five percent of the cost of making a weld is labor. This doesn't mean you should save money by buying the cheapest consumables around. In fact, it's just the opposite! You need to choose consumables based on how well they improve welder productivity and minimize downtime. At Arc-Zone, that's the only kind we sell, whether its an OEM part or a high quality after-market part, we deliver quality parts that are engineered to last and keep your welders welding. It's about making it easy for you to do business with us and making sure you have the welding accessories you need. We know even when you're working for the government, wading through the paperwork can be frustrating. We'll do whatever we can to make it easy, including sending you a quote via email or fax so you can get approval for the items you need. For a quick quote, use our online shopping system, and when you go to check out, select the "Print Order Form" button. Qualified Government Agencies can purchase on Net 30 terms, or with a government P-Card (Purchasing Card or Procurement Card). Just give us a call. We've worked with a lot of government agencies from the Argonne National Laboratories, to the U.S. Navy. To view our profile in the CCR database, Click Here . It's about making sure you have the equipment and consumables you need when you need them. Are you tired of having to wait for consumables or replacement parts because your supplier doesn't stock them? Arc-Zone serves a world market, and stocks a lot of the high-performance replacement parts that manufacturing cells need. We'll do whatever we can to make it easy for you to do business with us, including sending you a quote via email or fax so you can get approval for the items you need. For a quick quote, use our online shopping system, and when you go to check out, select the "Print Order Form" button. Whether you like it or not, equipment does become obsolete and replacement parts become harder and harder to find. If you've been holding off on upgrading your equipment, our Cash In and Trade Up program could be right for you. We've developed the simplest, most cost-effective way for you to use your outdated MIG guns, TIG or plasma torches, water coolers, and robotic peripherals like cash, and get new Arc-Zone.com productivity-improving products. At Arc-Zone.com It's also about making sure you have the knowledge to get your job done.